The chew is my favorite candy genre. From Now and Laters to gummies, I like the sweets where my mouth burns a few calories before the final full satisfaction of eating and swallowing. Yes, of course I also like the candies that just melt away, but I don’t yeaaaaarn for them – nor for the ones that I keep chewing until I’m ready to spit out, like gum. I enlisted my kids to join in since they’ve been bugging me for a month to eat these things and because it turns out kids like candy. whodathunk. So here’s our take on the 6 flavors we tried: Peach, Mango, Melon, Green Apple, Banana and Grape. Note that I cut these things in half for the kids, and I of course went full portion. Even the half portion had my kid chewing for a while. It appears Hi Chew is an apt name. First off with the peach, the kids liked it. Secondly, they had no idea it was peach. Which is ridiculous because it tastes just like peach. Ok maybe not the peach you get off the tree but every other peach taste you’ve had. I gotta veritable Shakespeare on my hands. I will say that generally speaking mango is a great candy flavor. It’s the one fruit flavor that actually tastes like the fruit. I mean I love grape more than the next guy but I’ve rarely if ever had a grape flavor that tastes like the grapes I buy from the store. With mango candy on the other hand, they usually taste like what I buy. So the Hi Chews do mango right. Now we’re on to melon. “It’s kinda like peach,” says Kid 1. I think it tastes like cantaloupe but the kids said not so much. On to banana, about which Kid 2 says “This one is really good”. Not sure I’ve ever heard a kid say that about any banana flavored candy. But this has a fruity banana taste. It’s more like heavy banana overtones of a general fruit flavor. “Oh my god it’s so good it’s awesome. yum.” I guess green apple is a hit. And they’re right again – these are super good. Green apple is generally always good yes? Can we all agree there? From Jolly Rancher to lollipops and Haribo the world over, most of us agree that green apple is often the best flavor of the bunch. With Hi Chew, the flavor isn’t muted at all. It’s strong and lasts all candy long. And finally grape: “I dont really like it, it kinda tastes like grape medicine.” WTF? That’s dissapointing to hear from the little’uns. And I disagree. To me these taste like concord grape juice. Really strong grape flavor that is almost like drinking a cup of juice. As I said above, grape doesn’t reaaaaaaaaallllllllllly ever taste like the grapes I eat from a store, but these taste exactly like the grape you get in grape juice. So to sum up – green apple, mango and peach was top 3 for kid 1, and mango (“favorite favorite one”), green apple and banana were the faves of kid 2. And I liked them all. Hi Chews should make millions in this country. They are like Starbursts without being too soft nor saccharine-y sweet, with flavors that are fuller and truer. The consistency is more like a Mamba right at the get go, but kinda turns to being a tougher bubble gum consistency in the middle before it breaks down and you swallow. I simply can’t just eat one of these. I’m always looking at finishing the entire package. Good for them – not good for the back fat. Finally, the flavors are the real hit here. They are strong and pervasive throughout the lifetime of the piece in your mouth. The banana is one of the most interesting to me since it’s absolutely a banana flavor, that they paired with a slightly general fruit so it’s like a real juicy banana. I keep wanting to re-eat that one. Also, the melon tastes a tad strange when you pop it in but then it’s all cantaloupe until the end. I love cantaloupe. And how many cantaloupe candies in America have you tried? 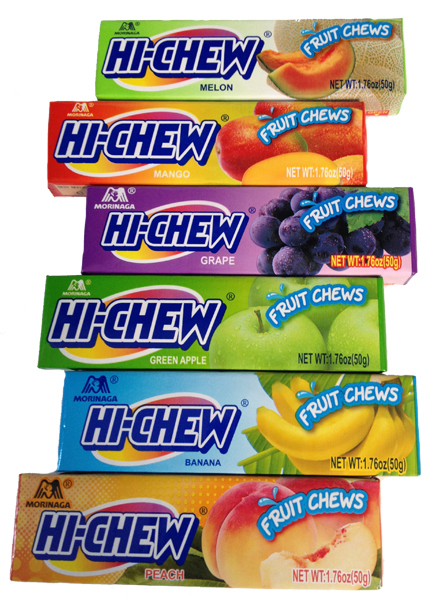 All you Starburst, Mamba and Now and Later lovers – go forth and buy Hi Chews. They are better. Yes, I said it. Melon is my favorite as well.. I wish they would release some of their other flavors in the U.S. already. They have cool ones in Japan like Lychee, Kiwi, Pudding, Dragon Fruit…etc. I mean, who wouldn’t want to try a flavor like Dragon Fruit? these things have really grown on me in the last few years. Matty’s right, they have the flavors nailed, but they OWN the consistency. Chewy delight. The Hi Chews folks sent us a note saying they are working on a few new flaves but nothing fun like Dragon Fruit. Strawberry was one of the new ones coming…eh. Ok. I’ll live. But I’d love a Durian flavor. i’m a huuuge fan of the hi chew. was ecstatic when walgreens and costco started carrying them and i could buy them en masse. one of my fave treats to bring to the ballpark, cuz they taste so good and last so long and keep your mouth busy, like seeds do, but yummier. How do you know what gasoline taste like?? yeah good question. in other news, I’d rather not find out. Does no one care that they contain hydrogenated oils? I am sure you will respond, with , “no, nobody cares”. I love me some Japan, but I am let down by the ingredients. They must be getting funded by drug lords because the marketing push for these things is ridonculous. I see HI CHEW emblazoned cars all over the place. i wanted to love them, but I can’t get past the crap ingredients. I care Claudia. But only because you do. I have only tried the mango and green apple and they are both delicious. They are waaay better then starbursts and now and laters. I love that the hi chew doesn’t stick to your teeth. That’s probably thanks in part to the hydrogenated oils. Eh. YOLO! I snuck a pack of grape out of the breakroom at work. They were glorious. It all started when I noticed them in Walmart. I was like “Eh, why not?” So I tried one after I bought it, and it was tougher than gum, which kind of threw me off and opened up the possibility that it may have been gum. After doing a little research, most of what I scan through on Google says it isn’t gum, and after a few weeks of eating more than half of it (only one small wrapped package) I don’t feel any different. This was the strawberry kind, which is amazing by the way! Your were spot on but your kids don’t know what they’re talking about. Maybe leave them out of these reviews? It’s true. We should. Kids are dum anyway. The grape one tastes just like the bubble gum grape flavor, which is great because you get to eat it. I know. I love eating. Im all about that grape bout the grape no melon. I’ve never seen a lot of these flavors! I’ve only ever had the mango, melon, and strawberry. Not a big green apple fan, so I don’t bother with it when I see it. Peach would be amazing!